The higher end segment of the SOHO / SMB NAS market uses Intel's Core-series and Xeon CPUs to deliver the required performance while supporting a large number of drive bays (typically more than 8, in a rackmount form-factor). Those are not the subject of discussion in this article. Over the last four years or so, Intel's play in the other tiers has been mainly with its Atom CPU lineup. A little bit of history gives us some perspective. 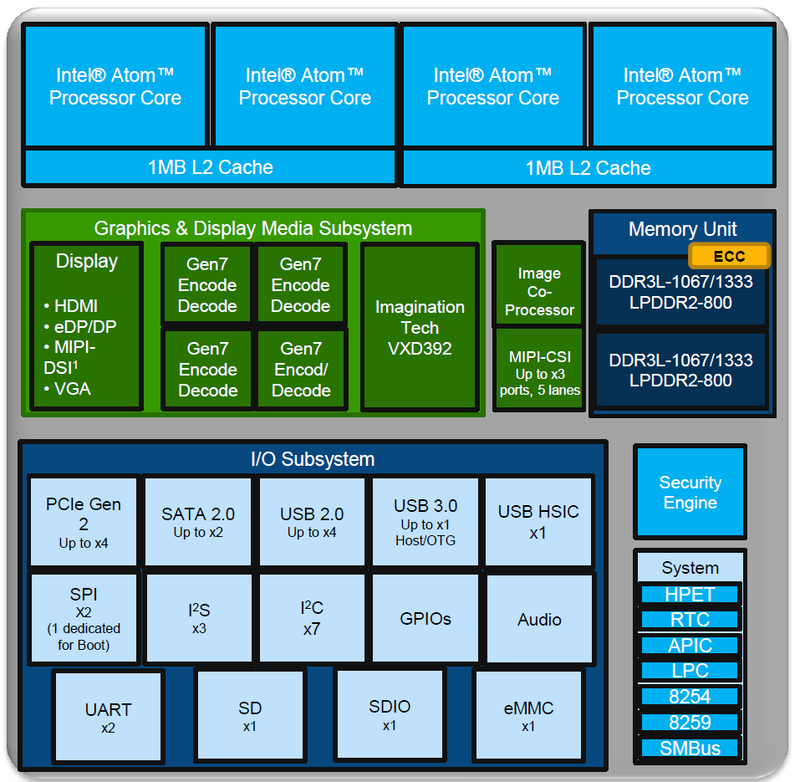 In 2010, Intel launched the first Atom-based storage platform (codenamed 'Bandon'), combining a D410 or D510 processor with the 82801R I/O controller (belonging to the ICH9 family). It was capable of supporting up to 6 drive bays, and we even reviewed LaCie's offering (5big Storage Server) using this platform. The Atom D410 / D510 were both based on the Bonnell microarchitecture (coming under the Pineview codename). Later in the year, Intel also pushed out updated Atom CPUs (D425 / D525) with slightly higher base frequencies for use with the storage platform. The QNAP TS-659 Pro II was one of the Atom D525-sporting NAS units that we reviewed. Pineview (45 nm) was followed by Cedarview (32 nm) in late 2011. It was still based on the Bonnell microarchitecture, but offered higher clock speeds and better performance per watt. Almost a year later, the official storage platform (codenamed 'Milstead') announcement with the Atom D2550 (followed by the D2700) and the 82801JB I/O controller (belonging to the ICH10 family) was made. The focus was on the improved graphics capabilities and HDMI output, which enabled interesting new use-cases related to media playback and surveillance video. LaCie's 5big NAS Pro and the Synology DS1812+ were some of the NAS units that we reviewed in this family. Between the rollout of products based on the Bandon and Milstead platforms, the NAS market for home consumers and power users started experiencing rapid growth. This market demanded a different set of features compared to SMB requirements. NAS vendors had to provide extensive multimedia support (not in terms of playback on a display, but the ability to manage and stream content). Being a cost-sensitive market, vendors were loath to use a two-chip solution (main CPU + I/O controller hub). Towards serving this market, Intel decided to re-purpose their Berryville CE processor (a 32nm SoC with two Bonnell-based Atom cores as the host CPU) which originally targeted the STBs. For storage solutions, these CE 53xx chips were relaunched in their Evansport avatar and pitched as a media server platform. The CE 53xx SoCs also happened to have a H.264 encoder in addition to a multi-format decoder (giving it the capability to act as a transcoder). We have been pretty bullish on Evansport, having reviewed devices from all of Intel's announced partners (Asustor, Synology and Thecus). In moving from 32nm to 22nm, Intel completely revamped the microarchitecture for their Atom cores. Bonnell was replaced by Silvermont, bringing out of order execution and other improvements into the picture. With so many code names associated with Silvermont-based products, we thought it would be best to present a bulleted list indicating the markets which Intel hopes to address with each of them. From our analysis of the various products, we believe the highlighted ones make sense for the NAS market. While the suitability of the Avoton and Rangeley for the NAS market is without question (they have a large number of SATA ports and PCIe lanes integrated into the SoC), the Bay Trail-D parts are quite interesting. The various possible components in a Bay Trail SoC are given in the diagram below. Depending on the target market (as specified in the bulleted list above), some of the components in the above block diagram are cut out. For example, Bay Trail-T does away with the SATA and PCIe lanes. Bay Trail-D is more interesting to us in this article, as the QNAP TS-x51's Celeron J1800 belongs to that family. look forward to benches + real world transcoding testing. I wouldn't hold my hopes too high.. Intel GPUs' Linux drivers for video playback have historically been 'unreliable'. (That is why I wasn't too enthused about XBMC and HDMI output on the Evansport-based NAS units from Thecus and Asustor).